Nürnberg take you back in time. 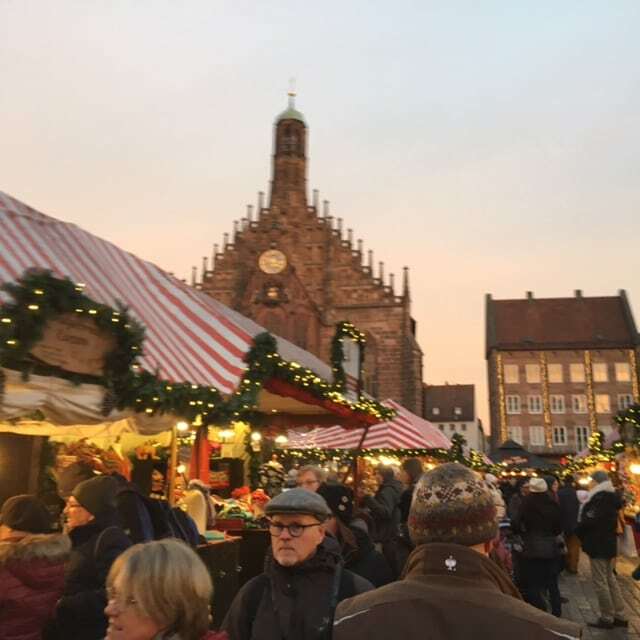 The city of Nürnberg has a very long history dating back tom the time of the 11th century when it became an important city and since that time takes people back into their time: From being a village at the crossroads from north to south and east to west. Already from the beginning the city became the right to hold also markets and this lead also to get the right to print money and charging taxes. From a prosperous city with the right to elect the rulers of Bavaria this city was given over to the population of Nürnberg and even the fortress was sold in the 15th century to the community of Nürnberg. The former ruling house, called the Hohenzoller kept the title of dukes of Nürnberg until the year 1918. 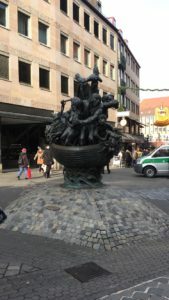 Due to the high quality of craftsmanship and the strategically position in the middle of Europe Nürnberg was very much liked by the rulers of the holy roman empire until the 30 years war during which the town was never taken over but due to a lot of damages and fights between the protestants and the catholics the area lost quite a lot of power and wealth. From there it became only a trading city in the middle of Europe. Only in the beginning of the 19th century Nürnberg became officially part of the Bavarian empire, after Napoleon restructured Europe and gave the are to the newly developed empire of Bavaria. In the 19th.century the city of Nürnberg became the center of industrialization within the area of Bavaria. With the first operative railroad in Germany it strengthened again it’s importance. For the first ride, a British train driver on a British locomotive were used and due to the high risk of brain damage to the people of this high speed of 15mph no passengers were willing to join that ride but instead some beer barrels were used and after their arrival in the neighboring city of Fürth with a proofed taste of the beer the people agreed on building more railroad tracks in Germany. Nowadays Nürnberg is considered one of the biggest railroad centers in Germany for passengers and goods, including also one of the biggest repair center of the national railroad of Germany. Especially in the second world war Nürnberg plaid a very important role for the Nazis. With the foundation of the zeppelin fields and the nazi party rally grounds the city plaid an important role in the propaganda of the nazi regime. The Nazis chose this area due to the strategically position in the middle go Europe and for the fact that is had the biggest train hub to bring as many people into the area of Nürnberg as possible. Nowadays it had one of the biggest and most important documentation center of Germany. Also the jewish question has been solved int he Nürnberg racial laws,established in the year 1935 in which the openings of new concentration camps and other killing methods were decided. 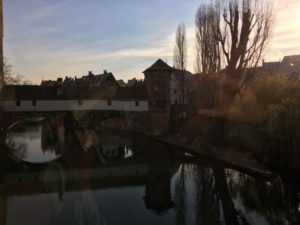 After the bombings in the second world war in which most of the surrounding area of Nürnberg was destroyed, also the Nazi war trials took place in the courtroom 600 in the court of Nürnberg. It was also the beginning of international war criminal trials and led to the foundation of the criminal trial in Den Haag in the Netherlands. Nürnberg also took a major role in the German “Wirtschaftswunder” with companies like Siemens, Grundig, AEG, MAN, etc. still nowadays Nürnberg is one of the major industrial city in Bavaria. 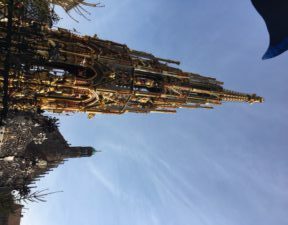 Nürnberg is a fascinating city and also a very different one. One one hand you will see a city form the 16th century with huge city walls, old houses and new shops and then you can see the train museum in Nürnberg, as one of the most complex in Germany, can see the German National museum of Nürnberg where the most important artists, writers, etc will be shown and there is for sure to explore also the Toy museum in Nürnberg. The toys used to play and still nowadays play an important role in Nürnberg since it has the biggest toy fair in Germany and is well known for all toy producers all around the world. Nürnberg’s highlight is definitely to see the toy museum and to explore historically and up to day toys. Besides that you will see that the city of Nürnberg is at the official capital of ginger breads. Ginger bread can be found everywhere in the center and also most of the factories are around the city center of Nürnberg. The prices vary very much from hand-crafted ones to the very cheap industrial made ones. You will find the ginger bread in all different varieties, such as with sugar, with ginger or no, gluten-free, with different chocolates (dark, white, or milky one), in different forms and variations. 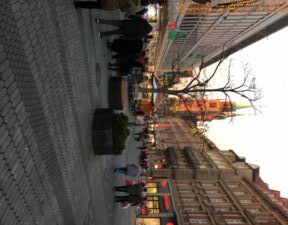 So you will see that there are many ways to explore the city of Nürnberg. Nürnberg reflect the Bavarian culture very well and offers all of the typically things of Bavaria: From beer halls, to old buildings, to Sausage kitchens and the world famous christmas market, the so called “Christkindlesmarket”, one of the oldest and most traditionally christmas market in Europe. It has nowadays more than 200 different sales stands and is one of the biggest in Bavaria. Each year it attract millions of visitors when a blond angel opens the market and sends a peace message to the world for a quiet and nice christmas time and the time to wait for the arrival of Jesus christ. In Nürnberg you will find also one of the oldest receipts of the sausages. They even had a legal fight with the town of Regensburg about who has the better and older sausage. The question was solved by the fact that Regensburg had the oldest sausage kitchen and Nürnberg the oldest receipt. But you will have to try bot, to know which ones you prefer. The recipe is form the 15th century and is still made in the same way including the precise length between 7-9cm and a thickness of 15mm and as ingredients only pork meat, salt, marjoram and some other herbs. It is even copywrited nowadays by the european union as a unique item for that region. Nürnberg is nowadays dealing very well wit its heritage and its history. The buildings of the second world war are still there and can be visited at any time. At the Nazi party rally grounds are nowadays a documentation center to inform people about what happened, why and making people aware that history should not be repeated. The old town of Nürnberg is also newly renovated and keeps now more and more the old buildings and combine as a perfect match old and new architecture and businesses. But do not miss out to try one of the red beers and take the time to see also the surrounding city walls and the fortress of Nürnberg, where you can explore how well this city is set in it’s surrounding. 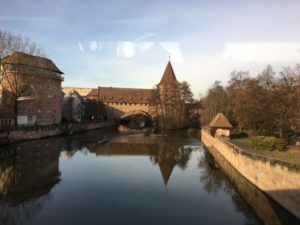 Visit Nürnberg and learn a lot of this city – history and fascinating stories of medieval time, christmas and the second world war – b(e)specialtours! 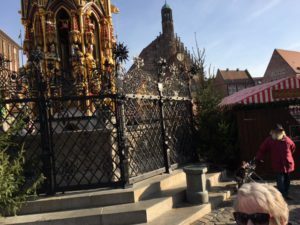 If you want to enjoy some great time in Nürnberg, book a private tour to Nürnberg with B(e)special Tours from Salzburg, or arrive directly in Munich, enjoy a city tour with our comfortable vans, enjoy a guided tour through the town of Nürnberg and continue a nice drive either through Germany, or Austria. So if you are planning to come to Nürnberg, or if you want to visit the city of Nürnberg and the romantic road coming from Salzburg then please do not miss a nice ride with b(e)special tours! It is fun for youngsters and the older ones and you can taste a lot of delicious typical Austrian dishes and of course a lot of Beer! Enjoy the fascinating city of Nürnberg – Nürnberg and history – with fresh ideas, food and a lots of fun – b(e)specialtours!